Photographs by the author 2006. You may use these images without prior permission for any scholarly or educational purpose as long as you (1) credit the photographer and (2) link your document to this URL in a web document or cite the Victorian Web in a print one. 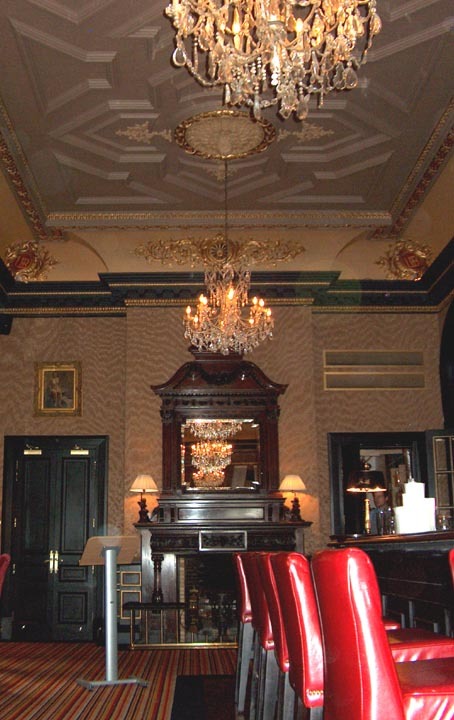 Merchants' Bank (now Merchant's Hotel) designed by Thomas Fitzpatrick. 1860. Waring Street, Belfast, Ulster, Northern Ireland. 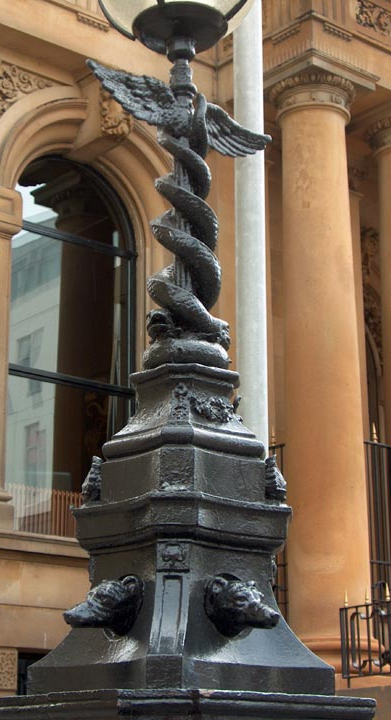 The ironwork outside the Ulster Merchants' Bank (designed by the then-young James Hamilton, a Glasgow architect, and cast in that Scottish city by ironmaster Laidlaw) is some of the finest surviving in Belfast, elaborate as lace. The motif of the four greyhounds on the lampstandard (sprouting a pair of wings, and a pair of serpents) is of particular significance locally. 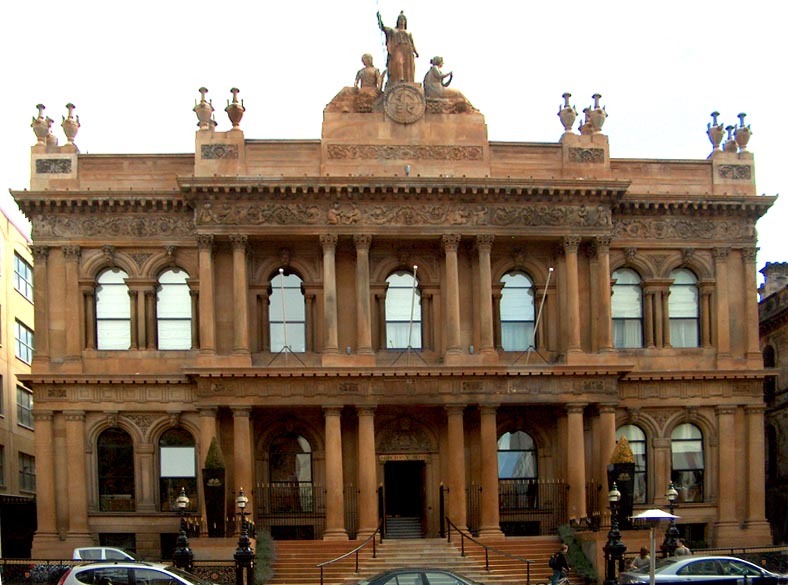 Built of golden sandstone, the building is in what C. E. B. Brett terms "an Italian-Romantic variation on the classical theme" (p. 37),Thomas Fitzpatrick's delightful ornamentation being more exuberant than one might find in more staid but classically inspired Victorian bank buildings. 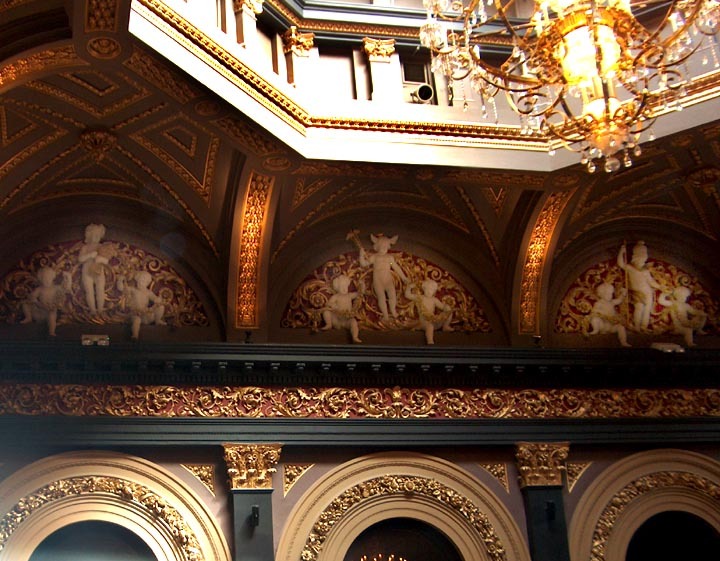 When the designs for the building were shown in the 1858 London Architectural Exhibition, the Athenaeum commented upon their being "very commendable, earnest, massive, rich, and suitable" (cited in Brett, p. 37); they are, however, perhaps not especially well-suited to the cramped space in which they have been realised. 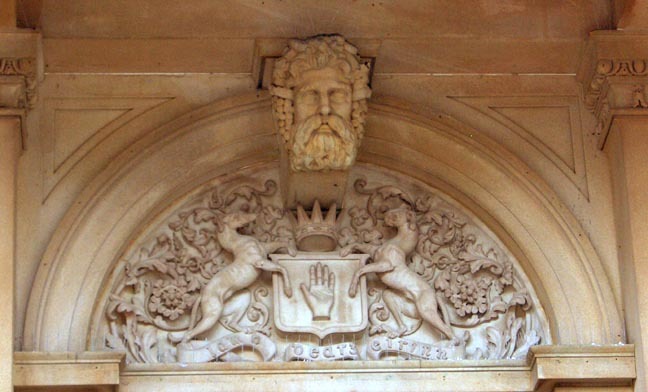 While the ground floor is in the Doric order, the first is in Corinthian, and the frieze is surmounted by the goddess Britannia, attended by Justice and Commerce. Suggestive of excessive wealth, twelve gigantic beakers crown the roofline, and intoxicated amorini play hide-and-seek among the frieze's arabesques. 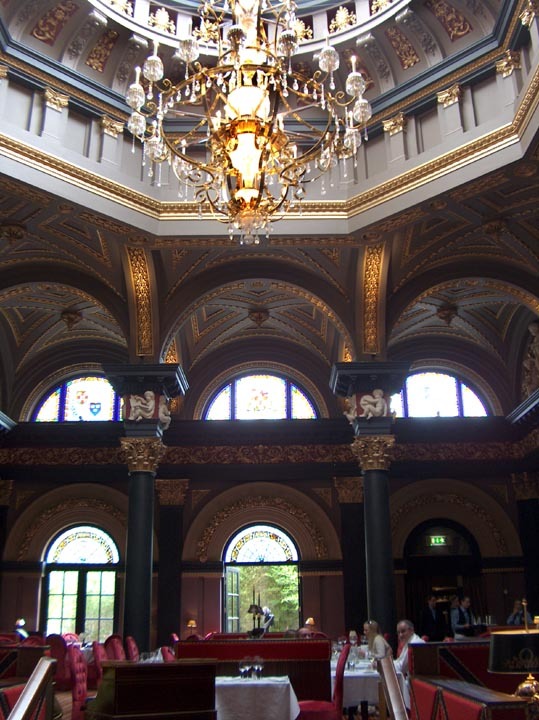 Inside, the vaulted dome, now the hotel lobby, features the stucco-work of George Crowe of Belfast, admirably renovated in 1949. 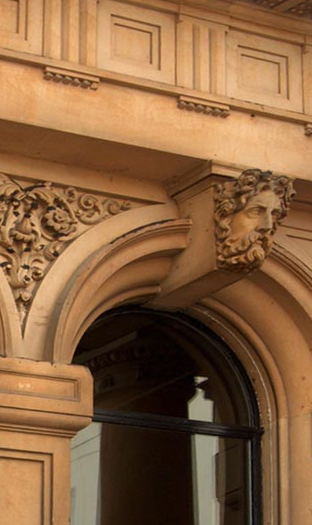 The sculptor responsible for the fine rooftop figure-group was Thomas Fitzpatrick. 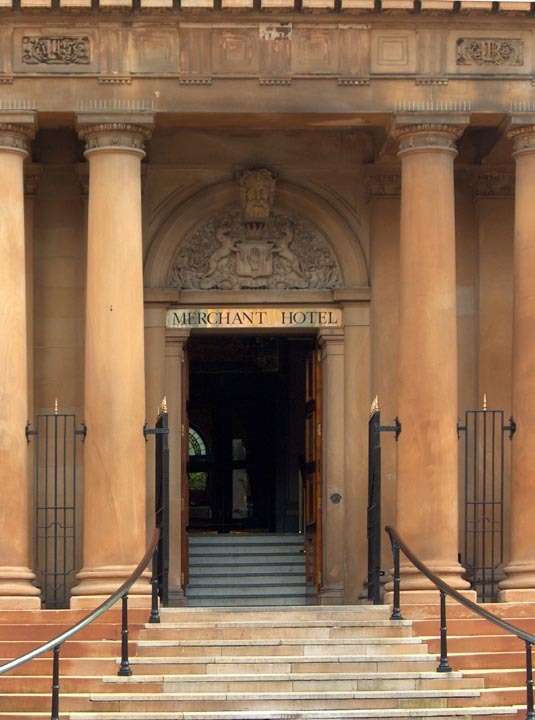 The building was completed in 1860, and still stands on Waring Street, but is now a luxury hotel. Brett, Charles Edward Bainbridge. Buildings of Belfast, 1700-1914. London: Weidenfeld & Nicolson, [c1967].